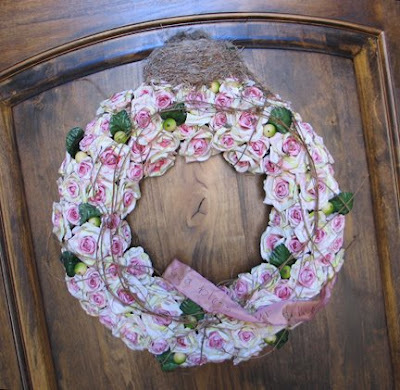 Inspiring Ideas with artist Jeanne Winters: Spring Wreath and Baby Birds! Spring Wreath and Baby Birds! Hey - welcome everyone from Mommyfest 2008 Blog Party!! I've joined the 5th Annual bash going on this week. Lots of prizes and links to great sites. Check them out and have fun exploring! Today's Inspiring Idea is my front door wreath: I took a "store-bought" wreath and embellished it with a coordinating ribbon. On the ribbon I wrote "God Bless our Home." To keep it simple, I used those little puffy fabric paints that you just squeeze out the tip. Very easy to write with! Just position the ribbon on the wreath first, so you can plan where to place your words. On mine, I actually wrote on both sides of the ribbon, because I have a twist in it. You don't have to get that complicated. Mark where to paint, take the ribbon off, lay it on a flat surface, paint the letters, let dry, glue the ribbon back onto the wreath and you're done! 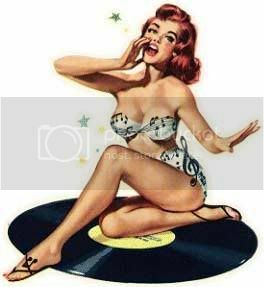 Now - did any of you catch my other embellishment? The bird's nest at the top? Yes - it's real! I have baby birds on my front door! Makes things a little tricky with visitors, UPS man, etc., but we've managed. Those mourning doves were so quick! We didn't catch the nest until there were eggs inside. It's been wonderful for my kids to see, but I would have chosen a less intrusive spot! HOW EXCITING! That's really neat about the birds nest. Hope you enjoy the blog party! What a great introduction to your blog. 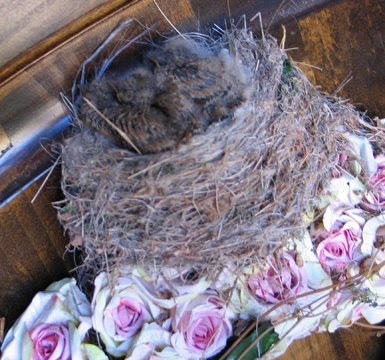 I love baby birds - how cute they are on your wreath. I found your site from The MommyFest Blog party. It's great to meet you! Have a nice day. how sweet to have little baby birds living along side you!! Great to meet you! I'm popping in from the Mommyfest site. I enjoy your blog. It's really nice. Hope to see you drop on over to my site, The So Called Me. I'd really love to have you! That's amazing, they sure were fast!